Rather nice traditional locals' pub on the Isle of Dogs. Unusually, it has a total of three bars, all with separate entrances; a saloon bar, a public bar, and a tiny snug. A commenter on this page tells us there's also a heated beer garden, and that the public bar is bigger than the saloon bar and has Sky TV and a dartboard. The saloon bar is relatively small and has a cosy feel. It features a discreet enough flatscreen, which on some of our recent visits has been showing football (with the sound on, but not too loud) and on others has been switched off entirely. There's a sunny conservatory leading off this bar, with dragon trees and white-painted patio-style decorative metal chairs and tables. Yhe snug is very small and cute and peaceful. The ladies' is shared between the saloon bar and the snug; don't know if the snug has access to a gents'. They also have a few tables and chairs out on the pavement that are well-patronised by smokers in good weather. The pub is generally populated by a few friendly locals, both men and women, and (despite the relative proximity to Canary Wharf) just the occasional chap in a suit minding his own business with a newspaper. On a Saturday evening visit in August 2008, the public bar looked quite full at 6pm, but the snug was empty and the saloon bar was almost empty, while the conservatory was being set up for someone's 40th birthday party. There was a change of management some time around 2007/2008, and on all our four or five visits since then, there have been four real ales available: Timothy Taylor Landlord (£3.30/pint in Jan 2011), Young's Bitter (£3.20/pint in Jan 2011), London Pride (£3.30/pint in Jan 2011), and either Deuchars IPA (Jan 2011) or Sharp's Doom Bar (Feb 2014). In June 2008 there was a slight problem with Kake's pint of Landlord; there was quite a bit of debris at the bottom, which I didn't notice until I'd almost finished it, since it tasted fine. I took the remaining inch of beer back to the bar and they were very apologetic and gave me my next pint (of Pride) half price. 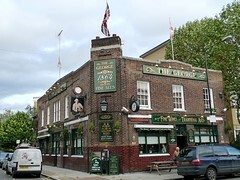 In January 2011, bob and elvum had the London Pride, Young's Bitter, and Landlord, and they were all drinkable. In August 2008, a grapefruit juice was £1.40. In February 2014, a pint of lime and soda was a rather shocking £3.70, despite the soda being from a gun (rather than small bottles, which gives some excuse for a high price). Fairly typical pub food is served. As of January 2011, food service ends at 8pm (at least on Fridays). As of February 2014, lunch service stops at 3pm (at least on Mondays). See photos of menu as of February 2014: starters/sides/sandwiches, mains, jacket potatoes/desserts/hot drinks. Kake's verdict: Although the beer is nothing out of the ordinary, the atmosphere is pleasant, and it's quite a gem given the area. Though I was somewhat horrified at being charged £3.70 for a pint of lime and soda on my most recent visit. Accessibility: All three street entrances have low steps — approximately 1-2cm at the entrance to the snug, and 4-5cm elsewhere. Once you're in, the whole pub is on one level. Last edited 2016-09-18 15:37:31 (version 32; diff). List all versions. Page last edited 2016-09-18 15:37:31 (version 32).